In the framework of the IAEA Technical Cooperation project INT7019 “Supporting a Global Ocean Acidification Observing Network – towards Increased Involvement of Developing States” a three week training event will be organized at the Sven Lovén Centre for Marine Infrastructure – Kristineberg, Fiskebäckskil, Sweden, 4-22 June 2018. The aim of this group fellowship training is to provide the full set of tools required to design and perform a complete laboratory experiment pertaining to study impacts of ocean acidification on selected marine organisms, as well as to analyze and prepare the data and results obtained for publication. Nomination for Fellowship is open to Member States participating in the IAEA Technical Cooperation project INT7019. A maximum of 12 Applicants will be selected on the base of a short CV and a letter describing their future planned activities related to the study of biological responses to ocean acidification as well as their needs and motivation to attend the training. Priority will be given to early-career scientists who have begun to work in the ocean acidification area. 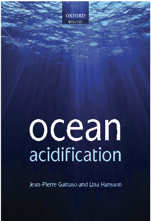 Experts in other fields interested in becoming involved in ocean acidification studies would also be welcome, space permitting. Only official applications through the IAEA can be considered. 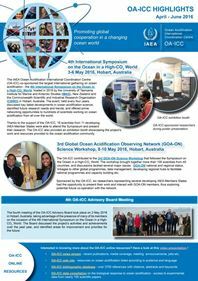 If you are interested in participating, please contact Lina Hansson at the IAEA/OA-ICC (l.hansson(at)iaea.org) for more information about eligibility and application procedure. Applications must be received by 13 April 2018.